Edison, of course, was the inventor of the Phonograph, so the industry owes its existence to his invention. It was in late 1877 that Edison asked his assistant to fabricate what would become the first Phonograph. It was not a practical instrument for anything but demonstration of the principle, but it caused a sensation when announced. Curiously, it would sit undeveloped for a decade as Edison concentrated on the electric lamp. It took a nudge from another inventor to get Edison interested in it again. Once he committed to its development, progress was swift. Within another decade the Phonograph was firmly established as a popular entertainment and business instrument. Until the turn of the century Edison was the dominant manufacturer in the field, however his competition was growing rapidly. In the cylinder format, he had competition from the American Graphophone Company, manufacturers of Columbia Graphophones and from several manufacturers of cylinder records. More worrisome, however, was the rapid rise of the disc talking machine. While most experts declared Edison's cylinder record to be superior sounding to any disc record, the cylinders were expensive to manufacture, fragile, and bulky. It was the ease of storing discs more than anything else that propelled discs to top of the sales charts. The superior marketing of the disc players and greater abundance of music available on discs was also a huge advantage. By 1905-1910, disc sales far outpaced cylinder sales. Edison supported his customers by supplying new selections on cylinder until 1929, even though he had discontinued the production of cylinder Phonographs 15 years earlier. In 1913, Edison introduced his first disc Phonograph. Naturally, it owed little to disc talking machines beyond the fact that the records were flat. 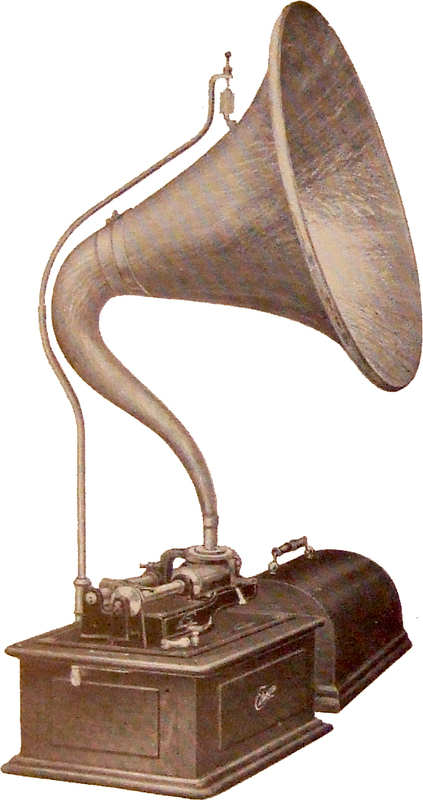 The Edison Disc Phonograph was a well engineered and excellent performing instrument. Its discs were not interchangeable with other brand's discs, but a well produced Edison disc record was superior in sound to the others. Edison continued to build his Disc Phonograph until 1929, when he capitulated and reluctantly switched to the disc format used by most every other company. Unfortunately the popularity of radio and the Depression wiped out what little demand might still exist for an Edison Phonograph, and the line was discontinued months after it was introduced.